From the beginning of the formation to the dramatic development in all aspects of life, Vietnam has been suffering from numerous noticeable events that have influenced the country in culture, education, politic and architecture. 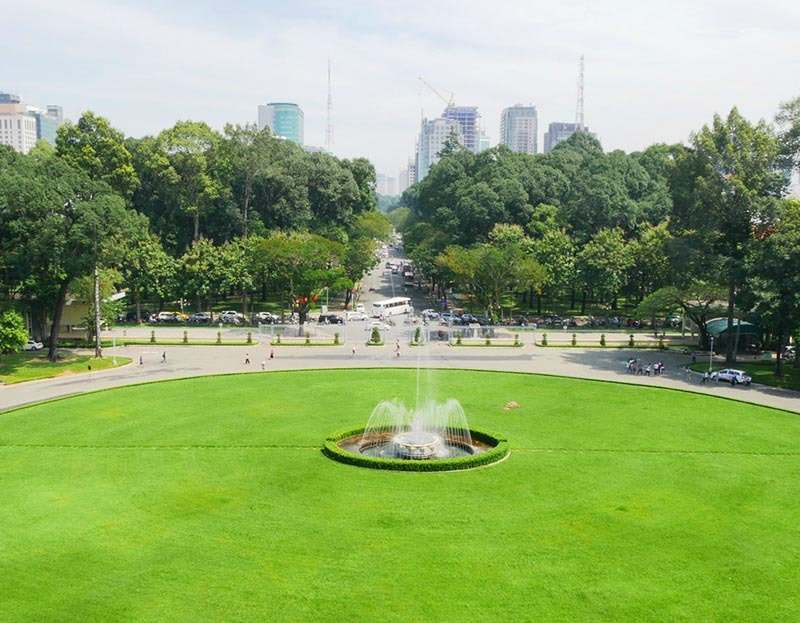 One of the significant remaining structures to be existent in the heart of Ho Chi Minh City is the Independence Palace also known as the Reunification Palace. 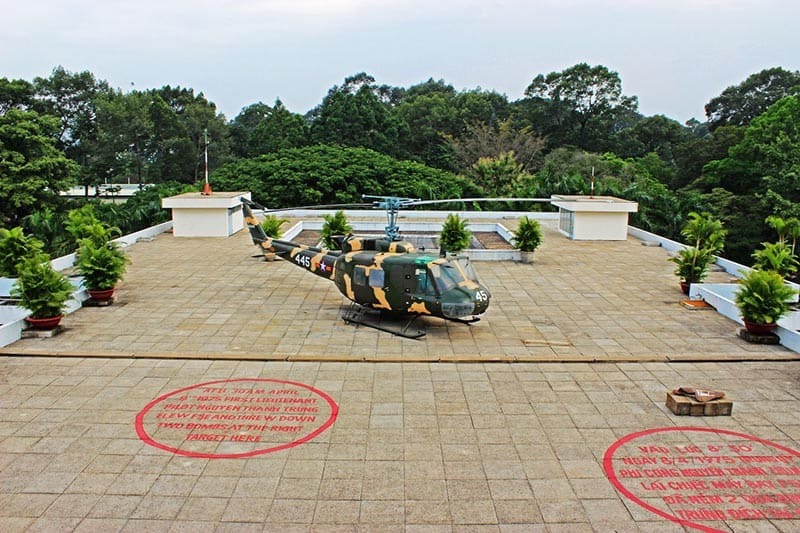 Through years, The Independence Palace has become an appealing attraction to tourists to Vietnam and foreigners as well. The Independence Palace, or the Reunification Palace, was built on the site of the former Norodom Palace with an area of 120,000 square meters. Standing at the end of Le Duan Street crossing Nam Ky Khoi Nghia Street, it symbolizes the traditional philosophy, oriental rituals and personalities of Vietnam nation in the harmonious combination with modern architectures. It is also surrounded by the 30th April Park in the front and Tao Dan Cultural Park in the back. In particular, the campus of the Palace is home to plenty of ancient trees with different species from the French period left. One thing you can imagine about this place is that there is a huge space of tranquil atmosphere since it is surrounded by thousands of green dots of trees and flowers. 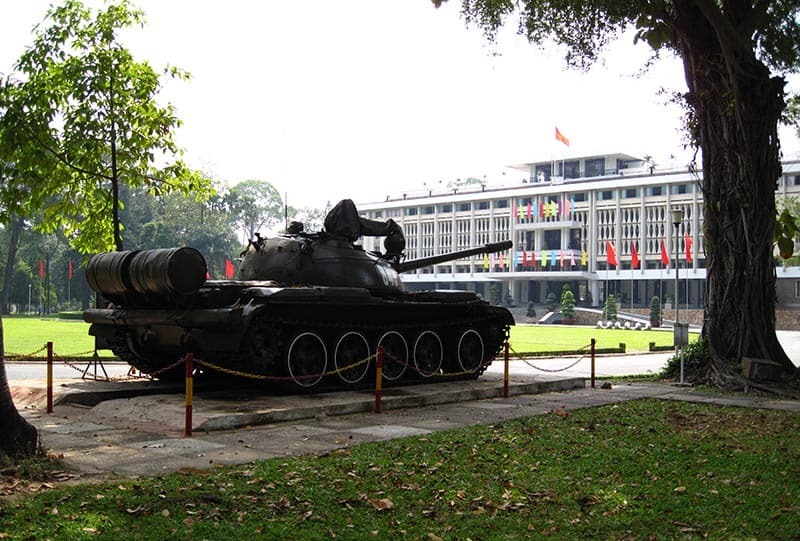 The iconic Reunification Palace made its name in global history when in 1975 a tank belonging to the North Vietnamese Army crashed through its main gate , thus signifying the end of the Vietnam War. This image is one of the most famous pictures depicting the Reunification Palace which has seen a rich and varied history and once served as the base of the US-backed Vietnamese General Ngo Dinh Diem during the Vietnam War, until his assassination in 1963. The Independence Palace is like a time capsule frozen in 1975 with two of the original tanks used in the capture of the palace parked in the grounds. Originally the site of the Norodom Palace also known as the Governor’s Palace its first role was as a home and workplace for the French Governor of Cochinchina. Built entirely Vietnamese people, the building was designed by architect Ngo Viet Thu and constructed in the meaning of praying for prosperity and enduring forever. With his own artistic eyes, the talented architect carried out a great architectural works along with the extremely logical layout of the interior and exterior architectural details. 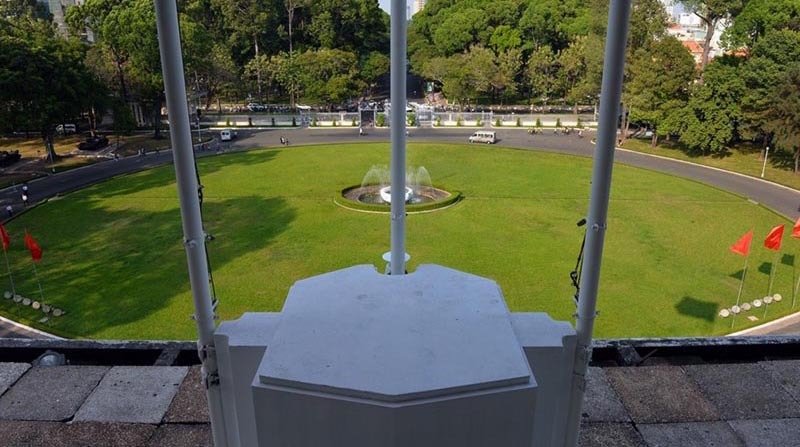 Accordingly, the front yard of the Independence Palace is an oval-shaped lawn with a diameter of 102m. The green lawn creates the mellow and cheery feeling when tourists walk through the entrances. Entering the Independence Palace for the first time, you will feel completely peaceful as the main color covering the whole view there is green. It is a five-storey building with the basement housing a warren of tunnels, a war room and telecommunications center. The war command room still has maps on its walls and period telecommunications equipment on display, whilst adjoining basement rooms feature war propaganda materials. Other areas of interest are the third floor featuring a card playing room, a fourth floor which once had a casino and was used for entertaining guests and a rooftop terrace with a heliport. 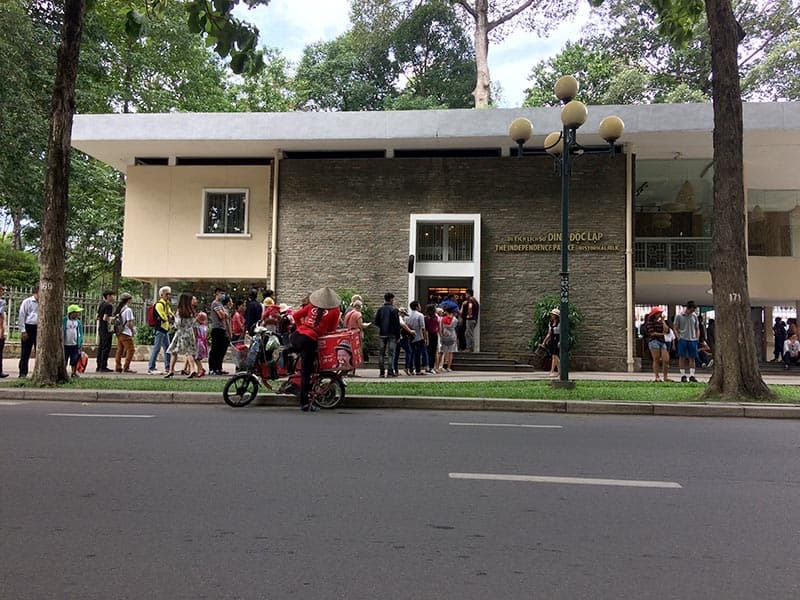 The Independence Palace opens daily from Monday to Sunday including holidays and Tet from 7:30 AM to 11 AM in the morning and from 1PM to 4PM in the afternoon. 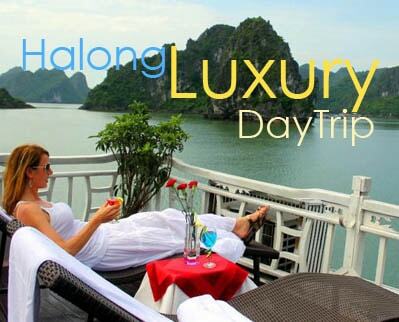 The entrance fee is purchased at the main gate and it is quite reasonable, only costs 40,000 VND for adult, 20,000 for student and 10,000 VND for those from 6 to 12 years old. Join our Ho Chi Minh city tour to discover this particular structure.